The collapse of the SCOAN building claimed about 115 lives, but while many are mourning their dead, a few are still searching for their loved ones. Among them is a Nigerian from Kogi State who has yet to find his wife of 18 years, Veronica (39). 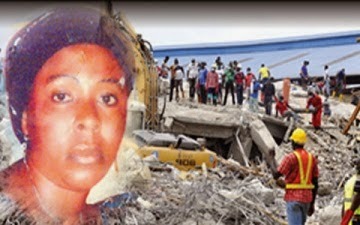 A worker in the laundry department of the Synagogue church, he pleaded anonymity because th church had warned members not to disclose any information on the tragedy to the public. He said he waits by the phone with his five children everyday expecting a call that would say her body had been found after many days of searching 16 hospitals. He showed a list containing the 16 hospitals he had visited with each one ticked with a pen to indicate he had been there and found nothing. “My gut tells me she is dead, but I will never rest until I find her body.My wife was among the visitors’ coordinators, serving the guests. She worked on the ground floor where the restaurant was. I am a worker in the church as well.I rushed to the gate immediately the incident occurred but I was not allowed to enter. The police blocked the entrance.They were carrying the victims out one after the other in ambulances. I called my wife’s mobile phone but it was not reachable. All through the following day, I got no news about her. I went there every day because I was in agony. He said before the incident occurred, he had not been to church for some weeks because he was ill. The last time he saw his wife was the morning of the day of the incident when his wife came home and they embraced each other as he laid on the bed. Punch equally reports that the National Emergency Management Agency spokesperson in the South West, Mr. Ibrahim Farinloye, said that was impossible as he ensured the ground floor of the site was turned out before the site was closed at 3.15pm last week Thursday. Farinloye also has some words for the families of those involved in the collapse. “The families of the victims need to exercise patience. This is going to take a while because there are three methods through which victims would be identified; by fingerprints, pathology and DNA. But if Veronica is not trapped under the rubble, where could she be?